Khamure was a ruler of some part of Egypt during the Second Intermediate Period, possibly during the 17th century BC, and likely belonging to the 14th Dynasty. As such he would have ruled from Avaris over the eastern Nile Delta and possibly over the Western Delta as well. His chronological position and identity are unclear. Khamure is one of the few attested kings of the 14th Dynasty with 2 scarab seals attributable to him, both of unknown provenance. One of the two scarabs is currently housed in the Petrie Museum, under the catalog number 11819, while the other was sold at an auction at The New York Palace Hotel in December 1991. The Petrie Museum scarab is peculiar in that it has a unique and elaborate decoration on its back indicating that it was given to an official of the highest rank. The scarab is inscribed with name of Khamure preceded by the epithet Netjer Nefer, "the good god", showing that Khamure was this king's prenomen. This means that Khamure is not listed in the surviving fragments of the Turin canon, a king list dating to the Ramesside period and recording the prenomina of the kings. The archaeologists Olga Tufnell and William A. Ward argue that the name written on the scarab seal of the Petrie Museum is actually "'Ammu", possibly to be identified with 'Ammu Aahotepre, a shadowy king of the late Second Intermediate Period. The egyptologists Kim Ryholt and Darrell Baker reject this reading, since Gardiner's sign N5 for the sun-disk is clearly readable on the seal together with the signs for Netjer Nefer. Hence, they argue, Khamure is the correct reading of the scarab, in agreement with Percy Newberry and Flinders Petrie. 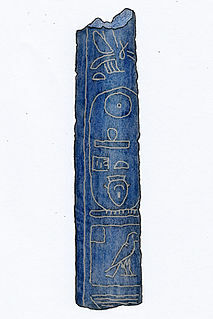 Although the chronological position of Khamure remains uncertain, Ryholt has proposed that he ruled in the 14th Dynasty, some time before Yaqub-Har and Yakareb. This estimation is based on a seriation of the scarabs dating to the second intermediate period. ^ a b Percy E. Newberry: Scarabs an introduction to the study of Egyptian seals and signet rings, with forty-four plates and one hundred and sixteen illustrations in the text, 1906, available online copyright-free see plate XXI, num 30, p. 150. ^ a b c d e f K.S.B. Ryholt: The Political Situation in Egypt during the Second Intermediate Period, c.1800–1550 BC, Carsten Niebuhr Institute Publications, vol. 20. Copenhagen: Museum Tusculanum Press, 1997, excerpts available online here. ^ a b The scarab on Digital Egypt, Petrie Museum. ^ Joyce Haynes, Yvonne Markowitz, Sue d'Auria (editor): Scarabs and Design Amulets : A Glimpse of Ancient Egypt in Miniature [Auction Catalog], NFA Classical Auctions, New York 1991, num 30, online reference. ^ William A. Ward: Some Personal Names of the Hyksos Period Rulers and Notes on the Epigraphy of Their Scarabs, Ugarit- Forschungen 8 (1976), p.353–369, see p. 368, num 42. Merneferre Ay was an ancient Egyptian pharaoh of the mid 13th Dynasty. The longest reigning pharaoh of the 13th Dynasty, he ruled a likely fragmented Egypt for over 23 years in the early to mid 17th century BC. A pyramidion bearing his name shows that he possibly completed a pyramid, probably located in the necropolis of Memphis. Semqen was an Hyksos ruler of Lower Egypt during the Second Intermediate Period in the mid 17th century BC. According to Jürgen von Beckerath he was the third king of the 16th Dynasty and a vassal of the Hyksos kings of the 15th Dynasty. This opinion was shared by William C. Hayes and Wolfgang Helck but recently rejected by Kim Ryholt. In his 1997 study of the Second Intermediate Period, Ryholt argues that the kings of the 16th Dynasty ruled an independent Theban realm c. 1650–1580 BC. Consequently, Ryholt sees Semqen as an early Hyksos king of the 15th Dynasty, perhaps its first ruler. This analysis has convinced some egyptologists, such as Darrell Baker and Janine Bourriau, but not others including Stephen Quirke. Nebmaatre is the prenomen of a poorly attested ruler of the late Second Intermediate Period of Ancient Egypt. Nebmaatre may have been a member of the early 17th dynasty and as such would have reigned over the Theban region. Alternatively, Jürgen von Beckerath believes that Nebmaatre was a ruler of the late 16th Dynasty. Khamudi was the last Hyksos ruler of the Fifteenth Dynasty of Egypt. Khamudi came to power in 1534 BC or 1541 BC, ruling the northern portion of Egypt from his capital Avaris. His ultimate defeat at the hands of Ahmose I, after a short reign, marks the end of the Second Intermediate Period. 'Aper-'Anati was a ruler of Lower Egypt during the Second Intermediate Period in the mid-17th century BC. According to Jürgen von Beckerath he was the second king of the 16th Dynasty and a vassal of the Hyksos kings of the 15th Dynasty. This opinion was recently rejected by Kim Ryholt. In his 1997 study of the Second Intermediate Period, Ryholt argues that the kings of the 16th Dynasty ruled an independent Theban realm c. 1650–1580 BC. Consequently, Ryholt sees 'Aper-'Anati as an early Hyksos king of the 15th Dynasty, perhaps its second ruler. This analysis has convinced some egyptologists, such as Darrell Baker and Janine Bourriau, but not others including Stephen Quirke. Qareh Khawoserre was possibly the third king of the Canaanite 14th Dynasty of Egypt, who reigned over the eastern Nile Delta from Avaris during the Second Intermediate Period. His reign is believed to have lasted about 10 years, from 1770 BC until 1760 BC or later, around 1710 BC. Alternatively, Qareh could have been a later vassal of the Hyksos kings of the 15th Dynasty and would then be classified as a king of the 16th Dynasty. Wazad was an Egyptian pharaoh during the Second Intermediate Period. According to the egyptologists Kim Ryholt and Darrell Baker, Wazad was a member of the 14th Dynasty of Egypt reigning c. 1700 BC. As a king of the 14th dynasty, he would have reigned from Avaris over the eastern Nile Delta and possibly over the western Delta as well. The Memphis-based 13th Dynasty reigned over Middle and Upper Egypt at the same time. Alternatively, according to Jürgen von Beckerath and Wolfgang Helck, Wazad was a ruler of the 16th Dynasty and a vassal of the Hyksos 15th Dynasty. This view is debated in egyptology, in particular because Ryholt and others have argued that the 16th Dynasty was an independent Theban kingdom rather than a vassal dynasty of the Hyksos. Sekhaenre Yakbim or Yakbmu was a ruler during the Second Intermediate Period of Egypt. Although his dynastic and temporal collocation is disputed, Danish Egyptologist Kim Ryholt believes that he likely was the founder of the Levantine-blooded Fourteenth Dynasty, while in older literature he was mainly considered a member of the Sixteenth Dynasty. Nubwoserre Ya'ammu was a ruler during the Second Intermediate Period of Egypt. This Asiatic-blooded ruler is traditionally placed in the 16th Dynasty, an hypothesis still in use nowadays by scholars such as Jürgen von Beckerath; although recently Kim Ryholt proposed him as the second ruler of the 14th Dynasty. Sheneh was a ruler of some part of Egypt during the Second Intermediate Period, possibly during the 17th century BC, and likely belonging to the 14th Dynasty. As such he would have ruled from Avaris over the eastern Nile Delta and possibly over the Western Delta as well. His chronological position and identity are unclear. Shenshek was a ruler of some part of Egypt during the Second Intermediate Period, possibly during the 17th century BC, and likely belonging to the 14th Dynasty. As such he would have ruled from Avaris over the eastern Nile Delta and possibly over the western Delta as well. His chronological position and identity are unclear. Yakareb may have been a ruler of some part of Egypt during the Second Intermediate Period, possibly during the 17th century BC, and likely belonging to the 14th Dynasty. As such he would have ruled from Avaris over the eastern Nile Delta and possibly over the Western Delta as well. His chronological position and identity are unclear. 'Apepi was a ruler of some part of Lower Egypt during the Second Intermediate Period c. 1650 BC. According to the egyptologists Kim Ryholt and Darrell Baker, 'Apepi was the fifty-first ruler of the 14th Dynasty. As such he would have ruled from Avaris over the eastern Nile Delta and possibly over the Western Delta as well. Alternatively, Jürgen von Beckerath sees 'Apepi as a member of the late 16th Dynasty and a vassal of the Hyksos rulers of the 15th Dynasty.